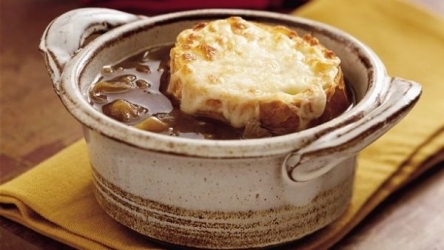 This French Onion Soup is a recipe for the slow cooker. Melt margarine and olive oil together in large skillet. Add sliced onions, sugar and salt to skillet, sauté approximately 20 minutes or until golden. Sprinkle onions with flour and cook an additional 2 - 3 minutes. To crackpot, add the remaining ingredients and the onion mixture. Cook at least 8 hours or follow individual crackpot directions. For the topping, brush 1" slices of French bread on both sides with olive oil. Sprinkle one side with parmesan cheese and broil. 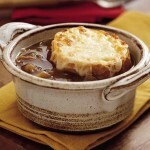 Put broiled side down in soup, sprinkle top side of bread with parmesan and top with grated Swiss cheese. Broil until bubbly.